Climate change is a major threat to marine life, affecting the most disadvantaged sections of society like small and marginal fishers, says a report of Food and Agriculture Organization (FAO) of United Nations, released last week. The report, titled The state of World Fisheries and Aquaculture, shows how climate change is relentlessly disturbing marine life which in turn is affecting the whole ecosystem. 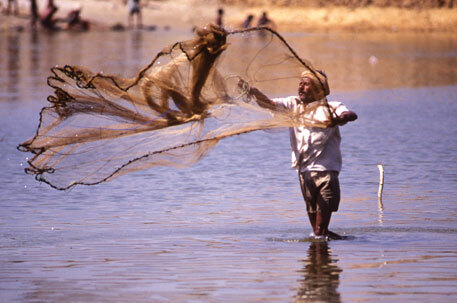 Over-fishing and pollution are other major factors, affecting marine life. The report gives details and examples from across the continents about how climate change is affecting aquaculture and how local people have been taking adaptation initiatives. The six regional case studies—on Lake Chad, Caribbean, Mekong Delta, Benguela Current, Pacific and Latin America—are some examples where some preparatory steps of adaptation have been taken; these also document some major impacts and where such plans can be implemented according to similarity in diversity. All the case studies show some region-specific impacts, but there are also some common impacts of climate change. How climate change is affecting livelihood of disadvantaged sections is illustrated through examples of migrant fisher people getting penalised (Lake Chad) and women fish workers being treated unfairly employees in Chile’s processing industry. Small-scale fishers will suffer the most if the production is disrupted even a little by climate change, says the report (see table). The report points out how fisheries and aquaculture play an important role in eliminating hunger, promoting health and reducing poverty. Currently, the aquaculture industry is self-sufficient and coping better in comparison to other food industry sectors, which are struggling to meet the mounting demand of an overall growing population. “A population of 7 billion has to be fed and we need a judicious regime which provides food and simultaneously safeguards the planet’s natural resources, saving them for future generations,” said the director-general of FAO, José Graziano da Silva, after the release of the report. According to report, fisheries and aquaculture are a source of 17 per cent of the animal protein consumed in the world; in case of some Small Island Developing States (SIDS) and Asian countries, this figure is a high 50 per cent. The report talks in detail about several local measures of climate change mitigation. The report clarifies that adaptation should be the primary objective. Adaptation can be planned (based on climate-induced changes) or autonomous (spontaneous reaction to environmental change). Planned adaptation may mean research funding for finding species appropriate to high-salinity environment and temperature fluctuations. Autonomous adaptation may mean changing the timing or location of fishing as species arrive earlier/later or shift to new areas. Several diverse and flexible livelihood strategies are also suggested. Among the highlights are: creating fish ponds in areas with recurrent droughts and flood periods, creating flood-friendly, small-scale homestead bamboo pens with trap doors and cage fish aquaculture development, using plankton feed in reservoirs. As for government institutions, the major recommendation is to make local people aware through appropriate media like radio and posters. Community-level vulnerability and adaptation planning is also to be encouraged by government institutions, says the report. Participatory fisheries data collection should be a joint venture of different countries, and countries should cooperate with each other, the report adds. The risk reduction methods suggested by the report include innovative weather-based insurance schemes and climate risk assessment for integrated coastal zone management. Global fish production continues to outpace world population growth, and aquaculture remains one of the fastest-growing food producing sectors but if things are not taken care of, climate change, pollution and over fishing would deprive us of food which seems most dependable and promising to feed future generations, says the FAO report.